So he walked most of the way, a long journey covering lower California from today's San Diego to Sonoma, establishing missions on the way. Following Fray Junipero Serra footsteps, we did the pilgrimage the modern way, driving that is, counting all the El Camino Bells along the way. Each of the missions has its own unique history, good intentions and sad tragedy. 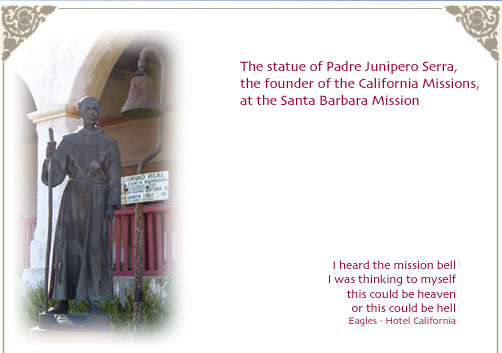 Some, like the Mission San Miguel Arcangel, just north of Paso Robles, was neglected, rundown and forgotten, but fortunately now, it is closed for restoration (somebody remembered it finally!). While others, like San Luis Obispo de Tolosa, situated right in the center of town, perfectly preserved, a living breathing church. Still others, like the Purissima, had turned into state parks (no kidding, the Hippo paid $4 to get in), but wonderfully preserved and shows how the entire community lived (that is, 2 rooms units, with mud floors and kitchen right in the living area, while the resident priest's palace has nice tapestries and rugs, refectory, separate kitchen, bedroom and study). Hippo accomplished the mission by visting all 21 missions, and if passion persists, even the ones in Baja California and beyond.